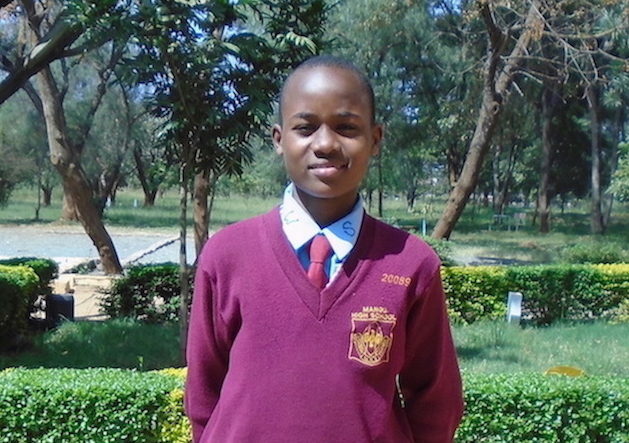 Samuel earned a ridiculously impressive score of 412/500 on his KCPE exam, and was therefore able to join one of the top secondary schools in the nation, despite having no money to pay for his school fees. He is the only child of his single mother; they live together in a tiny house on his old primary school’s grounds, as his mom works as a school janitor, a job that earns her roughly $60 a month. During primary school, Samuel’s excellent academic performance earned him a scholarship that lasted until the end of class 8. Then, he was placed by the government in a top national school. However, since his mother could not raise enough money to cover his first term’s fees, he was kicked out after a month of school. Fortunately, a well-wisher took note of Samuel’s situation, and managed to get him back in school for the remainder of the term. Samuel works very hard in school, often going to bed late and getting up early in order to spend more time studying. He does not like it when school closes for holidays, as for him, it means moving back to his primary school, where he has a bed to sleep in and nothing else. He loves going to school, and hopes to one day use his education to help his mother out of their current lifestyle. Samuel is loved by all of his teachers. He is a small boy who is very disciplined, and can often be seen asking his teachers for help after class. He enjoys reading, and spends more time looking over his textbooks than anything else. His determination to succeed in school is far beyond that of his schoolmates. Help Samuel achieve his dream of a bright future by sponsoring his education, being his friend, and cheering him through school life.